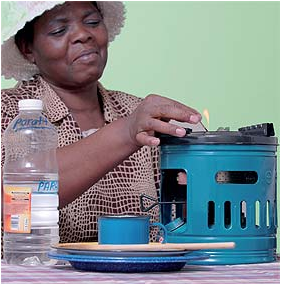 About 20 million South Africans use paraffin for cooking, heating or lighting. Many paraffin stoves are dangerous because of poor quality. Thousands of people in squatter camps have lost their homes and belongings in fires caused by paraffin stoves; some have even lost their lives. The paraffin products used by poor people are cheap and built at a low cost. They are dangerous because they are put together badly and made of weak metal. This means they can have loose parts or rust easily. Many people don’t know that they are dangerous or how to use them correctly. Government now has a plan to end the use of dangerous paraffin products. Last month, Minister of Trade and Industry, Mandisi Mphahlwa, said from January 2007 all paraffin stoves and heaters made and sold in South Africa should be in line with standards set out by the South African Bureau of Standards. Government’s plan means it is against the law to sell paraffin stoves and heaters that do not meet these standards. Senior project manager of the Paraffin Safety Association of South Africa, Teri Kruger, said government’s move was good news for everyone. "Paraffin remains a cheap and practical source of energy for most poor South Africans," she said. "Thanks to government’s plan, it will be illegal to sell bad quality products." This means paraffin will continue to improve the lives of people who cannot afford electricity, but its use will be controlled. The Paraffin Safety Association said it would support government by encouraging companies that make paraffin stoves and heaters to provide quality products at affordable prices. The Association, together with the Bureau of Standards, will watch companies that manufacture these products to ensure that they make good quality products. In the past few years the Bureau of Standards has started talking to companies making paraffin stoves to get them to follow the rules. The Paraffin Safety Association advises people who use paraffin stoves, heaters and lights to ask shop owners for certificates as proof that the Bureau of Standards approved the product. Safer products can save people’s lives. products imported from overseas will be taken away or returned to their countries.